The American Mastiff (Panja) has a curious and alert expression. The small eyes are wide set and almond shaped, with a classic, broad 60/40 head, widest at the ears. It has a scissor bite. The American Mastiff (Panja) should be "dry mouthed" and flews should not protrude. Ear crop is short, but NOT the "fighting" crop; natural ears are okay as long as they are the "button" style. (This type of ear stands on its own; just the top 1/4 to 1/3 is turned down toward the front only.) American Mastiffs (Panja) are a true working dog with the muscular body of an athlete. Wide chest with well sprung ribs, slight tuck-up in the mid-section. Front legs must be straight and heavy-boned, with very muscular hindquarters, with slightly angled hocks giving the impression of instant action. Dewclaws are removed. The dogs must have a clean presentation. The tail dock is 2/3 off. The American Mastiff (Panja) has an easy-going attitude. They are very devoted to their families and are excellent with children when they are raised with them from puppyhood and/or properly socialized. The American Mastiff (Panja) will take on the responsibility of watching over everything in your home, including the cat; they think everything has to be protected. Obedience training and an owner who knows how to display authority over the dog are strongly recommended to channel its protective instincts. They are an active breed and love to play. As with most intelligent dogs, the American Mastiff (Panja) tends to get bored very easily and can be prone to chewing. They love to be around their people and require proper socialization; they are excellent travel buddies. Mention the word "car" and they go bananas! The most impressive thing about these dogs is their guarding habits; they know which of your guests are welcome in your home and treat them as family. These dogs require a firm handler. If you have very little experience with guard dogs then this is not the breed to start with. American Mastiffs (Panja) are strong-willed and want to be the alpha; that is what makes a great guard dog. They need an owner who knows how to show strong leadership. 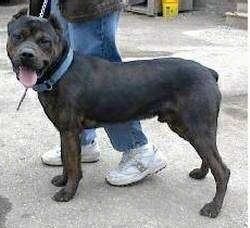 Anyone considering this breed would have to have experience with other large, dominant breeds. Not a breed for the meek owner. The objective in training this dog is to achieve pack leader status. It is a natural instinct for a dog to have an order in its pack. When we humans live with dogs we become their pack. The entire pack cooperates under a single leader; lines are clearly defined and rules are set. You and all other humans MUST be higher up in the order than the dog. That is the only way your relationship can be a success. There are no major concerns, although most large breeds are prone to hip dysplasia. This has not been a concern for this breed, but it is well worth keeping informed on. The American Mastiff (Panja) will do okay in an apartment if it is sufficiently exercised. This happy couch potato does best living close to the family; to feel part of your family keeps it happiest. They do not like to be left alone, and some may become very destructive while their owners are gone. Keeping them in a crate while their owners are away is recommended by some breeders. They are suited for all climates, provided there is shelter from rain, snow, etc. The American Mastiff (Panja) needs a yard, even if it's a smaller lot. They are athletic and need to be taken on long daily walks. They love to run; if they are kept in a smaller yard, a trip to the park will be a special treat. The American Mastiff (Panja) has a medium, flat coat. They do grow an undercoat in the winter; daily brushing will keep the stray hairs under control in the shedding season. However, shedding for this breed is minimal. American Mastiffs(Panja)do not require special attention to any areas for grooming; just a good bath and rub-down once a month will keep your American Mastiff's(Panja) coat in top condition. The American Mastiff (Panja) has a dark origin. Originally they were used (and unfortunately some still are) to guard drug dealer's houses, property, and yes, their drugs. They had to be intimidating and not too "friendly" with strangers, but allow traffic. They have a tendency to be aloof with new people, but allow entrance. American Mastiffs (Panja) were trained to allow under no circumstances access to property; they were set to guard. The breed first appeared in the Detroit metro area as a crossbreed of several dogs. Pitbulls and Rottweilers are known influences of this breed. Before being registered with the DRA in 1996, they were simply known as "rock dogs." However, since the DRA has recognized them, a good number of these dogs are not drug-guarding dogs, but loving pets. It is unknown whether this breed still exists.